Geolocation is the Trend for 2010. I already enjoy Google Latitude and occasionally post buzzes from my cellphone (even if it's an old-style non-touchscreen and without GPS) but my new "crash" is Foursquare! I wasn't using it for a long time since i didn't know it would be possible with my cellphone. I wish I had an iPhone, Android phone like Nexus One or Blackberry to use the full functionality of Foursquare, but for now i'm doing good with the mobile version for all other "less-trendy" (or less-smart) devices. In my words - foursquare is a game you play with your friends, it's about discovering new interesting places in the city and competing for becoming a "mayor" of a certain venue, for reward points given for check-ins and attractive "badges". 4sq user checks-in when goes to some venue that is on the map (4sq uses Google Maps), if the venue is not listed, user can add it and check-in there. When you tell foursquare where you are, that's called "checking-in". You can check-in from parks, bars, museums, restaurants... really anywhere. When you check-in we'll let your friends know where they can find you and award you points and badges based on your adventurousness. If you've been to a place more than anyone else we'll crown you the "The Mayor" of that place. We see lots of bars and cafes now offering "Mayor Specials" - a free coffee or appetizer or maybe a special discount to the mayors of their venues. 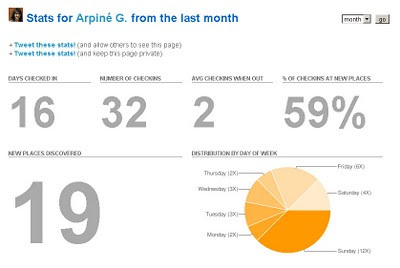 Badges are little rewards you earn for doing checking-into interesting places. For example, staying out late on a school night or frequenting too many karaoke bars. Most foursquare checkins will earn you points. You can earn points for your first checkin at a certain place or by adding a new place to our listings. We display a list of the users who have racked up the most points on the "leaderboard". The idea is that the more you experience, the more places you visit, etc. the higher your score for that week. The leaderboard resets every Sunday at midnight. 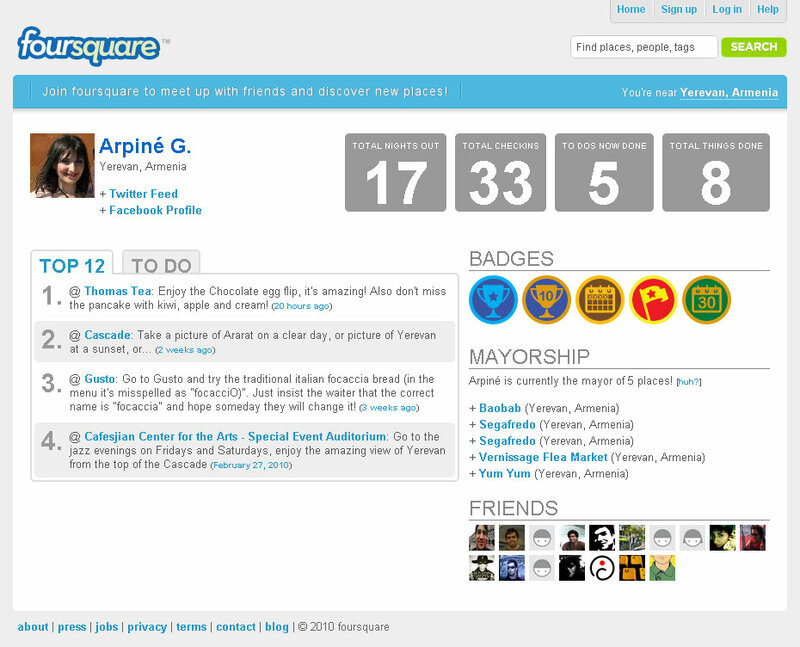 Every foursquare user has the ability to create both "Tips" and "To-Dos" for places. Tips are generally things you'd recommend to other ("Go to PDT and try the bacon-infused Old Fashioned") while To-Dos are more "notes to self" ("Remember to come back and try the pesto noodles"). I'm now excited to unlock as many badges as possible and become a mayor of at least 10 venues (to earn a certain badge). It's not always obvious how the badges are earned. 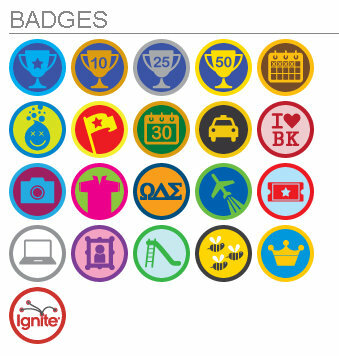 In fact there are many city-specific badges i will never earn unless i go travel in the US. 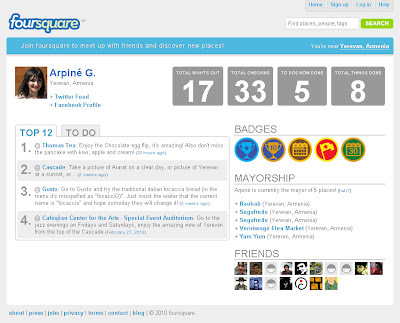 I found this interesting list of foursquare badges and their "unlocking" methods. There have been lots of buzz around Foursquare in all popular blogs on Social Media and not only. Recently there has been a race for the North Pole check-in! And it was announced that 1,000,000 foursquare app downloads were registered few days ago. P.S. I'm thinking of doing a small presentation of foursquare on the upcoming BarCamp Yerevan ;) And I'm sure the number of active users from Yerevan will increase by then.